Today I focused on Christmas cards. Specifically Christmas cards using some more of the wrapping paper I just bought at Costco. I love the design of the paper - it's so elegant and I wanted to use it instead of Christmas DP. Here's two cards that I made today, one using the wrapping paper as the background and the other using it as the focal point. I cut a large piece of Whisper White cardstock and glued a piece of wrapping paper on top (used glue stick) to give stability to the wrapping paper. I cut it to size and cut another piece of Whisper White 1/8" larger to use as a thin frame in-behind. I wrapped Cherry Cobbler seam binding around the background panel and then mounted it onto a card base of Old Olive. I inked the stamp with Stampin' Write markers and stamped onto another piece of Whisper White cardstock. I added red stickles on top of the poinsettias and buds and let it dry before continuing. I framed the stamped image with Old Olive cardstock and then mounted it on top of the seam binding, popping it up with dimensionals to add depth. 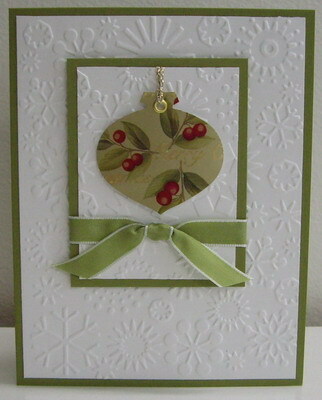 I used the BowEasy to make a bow with the Cherry Cobbler seam binding and mounted it onto the card with a glue dot. I cut two pieces of Whisper White cardstock (one large and one small) and ran them through my Big Shot with the Snowflakes embossing folder. Using wrapping paper glued to cardstock for stability, I punched out an ornament. I punched a hole in the top and added a gold eyelet. I cut a piece of gold thread and tied it through the eyelet and attached it to the small embossed white cardstock, popping it up with dimensionals to add depth. I attached the main panel to a frame of Old Olive cardstock. I wrapped Mistletoe ribbon around the main panel, tying a knot in the center. 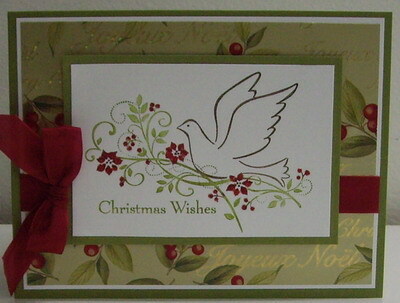 I mounted the large piece of embossed Whisper White cardstock to the card base of Old Olive. I mounted the main image on top, popping it up with dimensionals to add more depth. The main image is "weighted", meaning it is centered side-to-side, but has a smaller margin at the top and larger at the bottom. Yesterday I spent a little time in the art studio making an invitation for an upcoming High Tea that I'm holding. I am having Fran, Deb and Kelly (aka the Crafty Girls) over for High Tea this coming Sunday and the past couple of years I've always sent them a handmade invitation. I don't know what happened this year?? I only thought about making the card a couple of days ago and it's too late to mail. I was mad at myself for not thinking ahead ... but my son, Jer, suggested I make one and email pictures to them. Good suggestion Jer! This is the front and inside panel that I emailed to my friends. "High Tea Invitation for the Crafty Girls"
I purchased the vine and flower stamp at my local $1 Store ($3 for a set of 16 stamps - what a deal!!). I find with the clear stamps that sometimes I don't get a clean impression - the ink doesn't stick consistently. So I find if I ink the stamp with VersaMark first, then re-ink with my colored ink, the impression is much better. I stamped the vine in Always Artichoke ink. I stamped the flowers in Elegant Eggplant ink. I used the white gel pen to add white centers to the flowers. I lightly sponged Certainly Celery for some background color just around the middle of the vines. 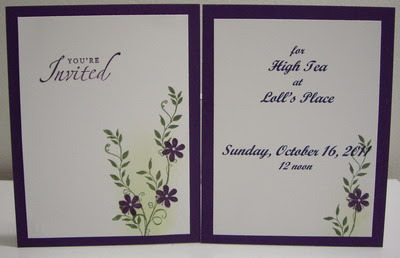 I stamped the sentiment "You're Invited" in Elegant Eggplant ink, using the Stamp-a-ma-jig for placement. The inside panel was generated on my computer. Labels: christmas, colouring with markers, dry embossing, heidi grace, Stampin' Up!